Thank you again for joining our Authorlicious™ family! 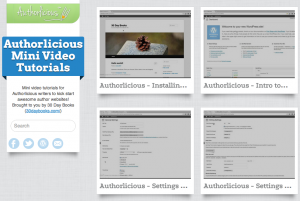 Head over to Authorlicious™ Mini Video Tutorials now to get started with your fresh new author website. You will need the password that was sent to your email address earlier when you purchased Authorlicious. If you have any questions, you can post them on the support forum, or search for existing answers there as well. You can post your questions and search the forum on the forum page. We try our best to reply to questions on the forum quickly.